It is hardly surprising that an enormous number of restaurants can be visited in the Ilha da Magia, where a rich variety of international dishes are served. Chinese and Japanese food, Spanish, Portuguese and even regional cooking, are some examples of what can be enjoyed here. From the most traditional dish to exotic food, the wide range of restaurants will meet all tastes. 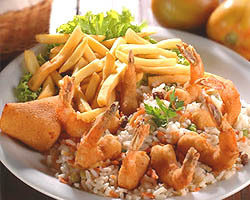 Seafood dishes are the specialty in Florianopolis. The oysters, which are cultivated in the south area of the island, in the turned side of the continent, can be consumed very fresh, soon after being extracted from the sea. Shrimps are Lagoa's speciality and the mullet is one of the most typical dishes in the region as well as the tench, which is fished between May and June. It is salted, dried and served grilled afterwards. The wide range of restaurants and prices that can be found here will suit every pocket.